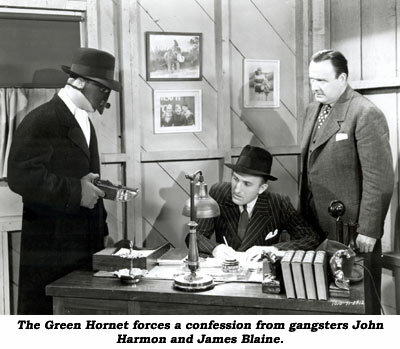 When I took up purchasing old time radio shows several years back I was anxious to add a few episodes of “The Green Hornet” to my growing collection. Since I was not around for its original airing, my knowledge of the show was based largely on material I’d read over the years by entertainment historians such as Jim Harmon and Alan Barbour plus viewing the short-lived ABC TV series starring Van Williams and Bruce Lee which ran in the mid-‘60s. The radio series, I must admit, somewhat disappointed me. 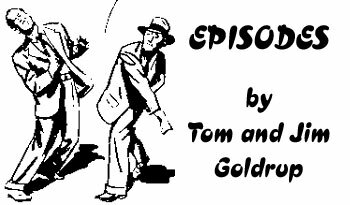 I loved the concept of the Hornet with his nifty disguise, his sleek, ultra modern car Black Beauty, gas gun, and his loyal assistant Kato, but I found the radio plots too mainstream and mundane, usually pedestrian crime stories lacking the sort of bizarre and exaggerated qualities usually associated with such bigger than life fictional heroes. I also knew of the existence of the two 13 and 15 chapter Universal serials George W. Trendle—who controlled the character and who had been disappointed by the way Republic had re-tooled his other creation, The Lone Ranger—had allowed to be adapted to the screen only under the stipulation Universal adhere stringently to the Hornet’s mythological history. But I’d never caught up to either cliffhanger until recently. 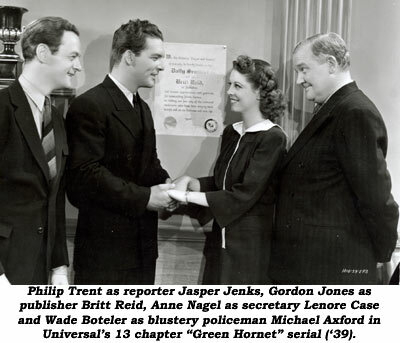 The problem with the first serial is getting used to Gordon Jones in the role of hero Britt Reid, alias the Hornet (Warren Hull would take the part in “The Green Hornet Strikes Again” made a year later). To a lot of other film fans, myself included, Jones is mostly recognizable as a slightly paunchy comical sidekick or second banana in the movies, even teaming with Roy Rogers on occasion. That’s a tough image to dodge, but with a little effort it can be done, particularly as the young Jones is leaner here and tries to deliver a sincere performance, which he does. As a matter of fact, I grew to like him a lot in the part, particularly his relaxed sense of humor, something rarely evidenced in traditional two-fisted serial leading men. I don’t know, once the mask was in place, how much of the action stuff Jones carried out, but I do know Al Hodge, who had a stint playing the character on radio, dubbed his voice. Keye Luke as Kato is no Bruce Lee in the martial arts department (he manages a few karate chops) but, as always in his long screen career, is likable and always fun to watch. Filling out the cast are old hands Philip Trent, Ralph Dunn, John Kelly, Wade Boteler and one of my favorite villains Cy Kendall, with Anne Nagel, more versatile in the acting department than most serial queens, effective as Lenore Case. Also be on the lookout for a young Alan Ladd to show up early in the proceedings as an aviator. “The Green Hornet” differs from most serials in that, at least until the wrap-up conclusion, our hero goes after an assortment of different bad guys with (seemingly) non-connected nefarious schemes on their evil minds, from graft at a tunnel construction site to an auto-stealing ring. This allows the four man writing team of George Plympton, Basil Dickey, Morrison C. Wood and Lyonel Margolies a bit more leeway in developing situations and conflicts, although most of the actual cliffhanging situations are not particularly unique or innovative. Old directorial hands Ford Beebe and Ray Taylor set a good pace and the whole thing has the feel of a solid B crime thriller of the era with lots of stock footage of car crashes and racing fire engines plus an uncredited musical score which borrows heavily from studio vaults, particularly Frank Skinner’s memorable “Son of Frankenstein” motifs (village sets leftover from the Frankenstein series can often be glimpsed). 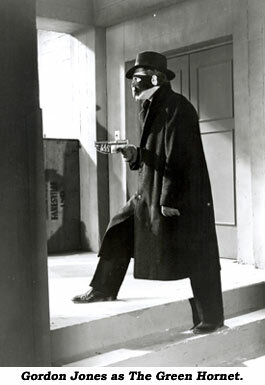 “The Green Hornet”—it must also be admitted—has a modest, occasionally cheap look and feel (Universal certainly could have used Republic’s Lydecker Brothers given all the airplane crashes depicted) and is definitely not as imaginative or innovative as it could have been had Republic owned the rights to the character, but it’s largely entertaining. Jones and Luke work well together, there’s plenty of action and enough old-fashioned excitement to go around. It’s not a great serial, but it’s a pretty good one. In Ch. 2 of “Black Arrow”, Robert Scott falls into a burning building. However, that fall never occurs in the Ch. 3 resolution. Although Tommy Carr was primarily known as a director, he began his motion picture career as a child actor. 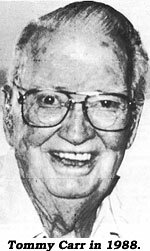 Tommy, the son of director William Carr and actress Mary Carr, was born on the 4th of July 1907, in Philadelphia, PA. Among the films he appeared in as an actor was the serial “Flash Gordon’s Trip To Mars” in which he portrayed Captain Rama, assistant to Anthony Warde’s Tree People King. He also acted in “S.O.S. 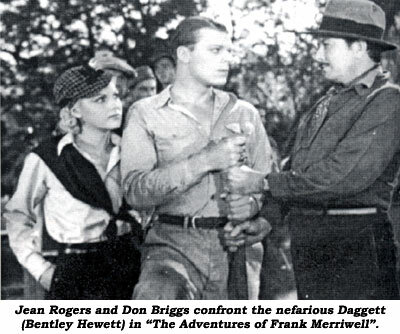 Coastguard” (Ensign Jim Kent), bits in “Fighting Devil Dogs” and Scott Kolk’s “Secret Agent X-9” (Agent Tracy) and a good role in The Three Mesquiteers’ “Range Defenders” (‘37). Much earlier, at age 13, he was featured in the silent Pathe cliffhanger “Velvet Fingers” (‘20). Tommy became tired of small roles, having had hopes of making bigger progress as an actor, and so decided to begin work behind the camera. He started as a script clerk, then a dialogue director, and finally worked his way up to assistant director. In 1945, Tommy earned his first director credit on a Sunset Carson Republic western. Tommy went on to co-direct such serials as “Jesse James Rides Again”, “Superman”, “Congo Bill”, “Bruce Gentry”, “Pirates of the High Seas”, “Roar of the Iron Horse” and did second unit work on “Brick Bradford”. Tommy Farrell, who also co-starred in “Pirates of the High Seas”, remarked on his memory of working with Carr, saying, “Tommy was 2nd Unit Director, Spence Bennett was first. Spencer had no sense of humor, I mean zero. But Tommy was funny as hell. He said, ‘This is your first serial, right? Well, there’s nothing to be worried about, it’s really very simple. In this first scene you and Buster (Crabbe) come up out of the hold, the pirates see you, you get into a big fight and one of the pirates hits you over the head and you fall overboard. There’s a dear.’ I said, ‘There’s a dear?’ He said, ‘There’s really nothing to it. Now the next one—you’re looking for Buster, you can’t find him and all of a sudden these three guys show up, chase you and you fall over the cliff. There’s a dear.’ Every time something terrible happened to me he said, ‘There’s a dear.’ So when I saw him later (at the Memphis Film Festival in ‘88) I came up behind him and said, ‘I brought you a chair to sit down, but when you go to sit down, I’m gonna pull it away. There’s a dear,’” Tommy laughed. 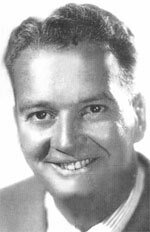 A terrific director, Tommy Carr died April 23, 1997, in Ventura, CA. Most serials spell out the basic plot in chapter one, then spend the following weeks resolving it. Some leave many questions unanswered…but I’m sure you’ve already noticed that. 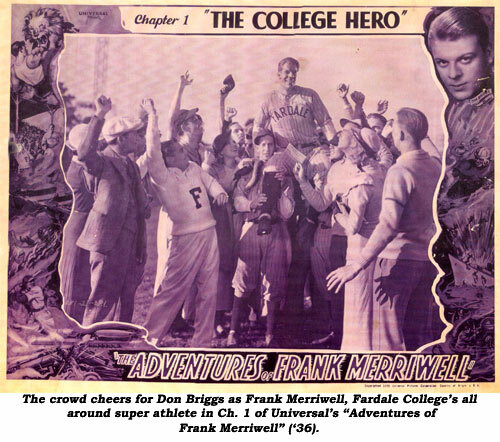 Universal’s “Adventures of Frank Merriwell” (‘36) with Donald Briggs doesn’t explain the plot or answer the questions. There is a mystery figure (sometimes called Daggett) wearing a half mask, somehow familiar with secret passageways in Frank’s house which no one else knows of. We never learn who he is, although publicity refers to him as a distant relative. He loves that mask, even sleeps in it, but it only conceals one side of his face. He raises it on occasion, as when using binoculars. Shouldn’t a mask hide something? I guessed it might cover a disfigured face, but when he appears without it in Ch. 12, his appearance is perfectly normal. Jeff (Sam McDaniels), family servant, recognizes him and calls the police. When he wore the mask, Jeff mistook him for a ghost. He doesn’t even appear in the first episode, where the only reference to the plot is a telegram summoning Frank home. Then, he’s all over the place, after a ring, a chest of gold, and a Mexican mine. The villainy isn’t very effective. Most chapter climaxes are the result of chance, rather than nefarious activities. Chance also plays a major part in stretching the story to 12 chapters. Over and over, Frank replaces some character taken sick or injured at a crucial moment. When Frank finally rescues his father in Ch. 10, we wait for an explanation of what has been happening. I’m still waiting! In Ch. 10 Frank brings Mexican soldiers from a Fort Mendoza…named after Manuel? In the last chapter, Frank’s dad, Charles Merriwell, faces Daggett (Bentley Hewlett), and we hear: Daggett: “You know what your stubbornness has cost you—ever since Mendoza led you to the Aztec treasure in the Mountain of Gold.” Merriwell: “Keeping that secret wasn’t stubbornness, Daggett. It was my right.” The police arrive after Daggett is wounded in a struggle for his gun. The serial’s title character isn’t even around for this; he’s off winning a football game practically single-handed and the serial ends. That’s all we ever learn of the plot. Want more questions? Who is Miss Russell? (I have her copy of the script, and wondered.) Why did Frank Merriwell, champion at every sport he played, have difficulty just walking in some early non-action scenes? Was Donald Briggs injured during production? Viewing this serial raises more mysteries than it solves. Perhaps some SR reader can explain it to us.